The 10 Days Uganda safari takes you to visit some of the best parks in Uganda. During the safari you will visit Murchison falls, trek chimpanzees in Kibale park and also participate in the gorilla habituation process to be part of history. This 10 days gorilla habituation experience safari is the best safari option for those with 10 weeks, for a holiday in Uganda. 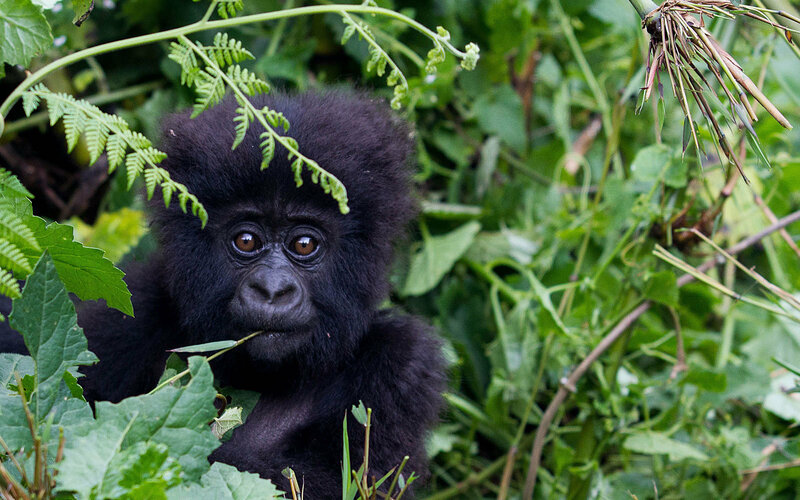 10 Days Uganda safari | 10 days Gorilla safari | 10 days wildlife safari | safaris and tours in Africa. A guide from our company will come pick you up from your hotel in Kampala immediately after breakfast. Drive to Murchison fall, a journey that takes about 6 hours and there is also an option of visit the rhino sanctuary located along the route to Murchison. Dinner and overnight will be at either. Luxury- Paraa safari lodge Moderate Murchison River lodge. / Basic- Red chilli Bandas. In the morning right after breakfast, you will drive to transfer to Hoima. Visit the different communities and then relax at Hoima cultural lodge. In the morning right after breakfast, the guide will pick you up from your hotel to transfer to Fort portal. Arrive in the afternoon to have lunch. Go visit the kings palace and the local communities this afternoon. Overnight at Luxury Ndali Lodge / moderate Mt of the Moon Hotel or Crater Lodge, Basic – Chimpanzee guest house. In the morning after you will go to the park headquarters for briefing and then through the forest go search for chimpanzees. Return from the trek in time for lunch and then later in the afternoon go for a nature walk in the Bigodi wetland. Overnight at previous lodge. Go for a scenic drive though Queen Elizabeth Park to see tree climbing lions before proceeding to Bwindi Impenetrable forest. Overnight at your lodge. Overnight at basic- Buhoma Community Bandas / Moderate- Gorilla Mist camp or Gorilla safari Lodge, or Ichumbi lodge / Basic- Buhoma bandas, Kisoro travelers rest o Nkuringo Virunga terraces. In the morning right after breakfast, you will transfer to the starting point to start trekking gorillas. The trekking time ranges between 2 to 8 hours. Once you meet the gorillas you are allowed to spend 4 hour following them and then later return to the starting point. Overnight at previous lodge. In the morning right after breakfast, you will drive to transfer to Lake Mburo National Park the drive will take 5 hours arriving in the afternoon. Check into your hotel, have lunch and then later go for a boat ride Lake Mburo. Overnight at Luxury- Mihingo lodge/ Moderate- Lake Mburo safari lodge / Basic- Rwonyo Bandas. Early in the morning before sunrise, go for a game drive in the park searching from wildlife and then later you will drive to transfer back to Kampala.